GM Tech 2 comes with Authentic GM software and provides on-board diagnostics on all GM systems from 1992 to 2012, supports GM, SAAB, OPEL, SUZUKI, ISUZU and Holden with free 32MB card and CANDI module. GM Tech2 can do coding and programming. And here are the instructions for gm tech 2 how to do the self test and the FAQ list. Q: Is there Spanish for GM tech2? A: No, GM tech2 is only English available. Q: Does GM tech2 support coding? A: Yes, it does, but you need to buy an additional TIS2000, TIS2000 support cars programming until 2007 year. Q: Can TECH2 support key coding and electronic control unit programming for all OPEL and Isuzu? but TIS2000 only support GM and Opel, not support Isuzu. Q: GM TECH2 support airbag reset? If not, please recommend me another one tool, my car is Chevrolet Tahoe 2007 year. A: Yes, GM TECH2 support airbag reset for Chevrolet Tahoe 2007 year. Q: Does GM TECH2 support reading Car VIN number? How to read? A: Yes, it does. After selecting the car model, enter function menu, and you will find the VIN number reading option. Q: I`m interested in the GM Tech2 Diagnostic Tool and I would like to know which diagnostic functions that tool has for a Hummer H3. codes and to read some parameters regarding those controllers? 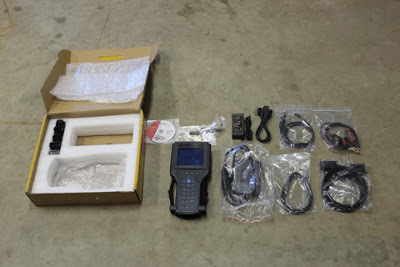 A: GM TECH2 contains Hummer H2 H3 software (from 2007 to 2010 year), so Tech2 is able to diagnose Hummer H3 2007-2010 year. As for reading parameters regarding those controllers, it is theoretically compatible, advice you have a try. Q: Does Item No. SP23-B diagnose gm pu's too (1500,2500hd,3500? A: Yes, it will work on pickup 1500,2500hd and 3500. Just if the cars are 24v, you may need a power supply adapter. Q: GM TECH2 contains Saturn software? A: yes, Saturn software is included in the GM software English and support from 1991 to 2010 year. Q: Is GM TECH2 available on my Cadillac year 1996? A: Yes, GM TECH2 works with Cadillac. Q: Does GM Tech 2 work with Australian Holden 1998? A: GM tech2 is only compatible with North American Holden, and our software for Holden only work with Holden from 1999-2012.
but only packed with the car adapter. Q: I bought one GM TECH2 and the TIS2000 software can’t be installed and no identification, what’s the problem? A: If the TIS2000 you are trying to install is contained in the GM TECH2 software, then it is useless to install TIS2000 software. To program electronic control unit, I advice you buy an extra TIS2000 to work with GM tech2. check where the problem is; have no idea on how to operate self test? Refer the self-test manual at GM TECH2 “technical support /service”. Q: GM TECH2 one button doesn’t work how to fix? A: If you have new version GM tech2, there are two ways to solve: 1) we send you a new button to replace; 2) please send back to repair. If you have old version GM tech2 installed with the newest software, the button maybe won’t work. Q: When I use GM TECH2 for the second times, the tool starts to smoke, and my car voltage become 14V from 12V, what’s the matter? especially the car which has a poor contact of electrical ground. 2.How to do ECU programming with GM Tech2 ? you had to use Saab TIS2000 and USB dongle. the hardware key kit has to be filled in and sent to the address at the top. In case the form is missing, the document is also in the TIS 2000 newsletter (see icon in the TIS 2000 tool bar). At first, the user receives a temporary code until the key is registered on the next TIS 2000 CD. Select the application ‘Service Programming System’ on the TIS 2000 start page. Connect Tech 2 scanner to vehicle. Power on device – “Tech 2″ is displayed on the screen, then press “ENTER”. Turn ignition to ON without start the engine!!! Select “F1: Service Programming System (SPS)” in the main menu. Press “F0: Request Info” on Tech 2. If Tech 2 has already stored vehicle data they will be displayed now. In that case, Tech 2 asks you to either use the current data (hold data) or request further information from the ECU (continue). For the selection of “Next” the vehicle has to be identified as requested by Tech 2. During the Request Info the Tech 2 receives information from the selected device. If the ECU was replaced a “Request Info” has to be performed for the NEW unit. Since the new ECU is not programmed on delivery, the retrieved information is not complete. For that reason, TIS 2000 gives instructions as how to enter the missing vehicle data. Follow the instructions on the Tech 2. Then press “Exit” on the Tech 2, switch it off and disconnect it from the vehicle. Connect Tech 2 to the pc, switch it on, and click on ‘Next’ on the pc. Confirm VIN or, if necessary, enter correct VIN, then select ‘Next’. Validate vehicle data and, if necessary, change with the pull-down menus. A new window displays a “Summary” (follow below) with the selected data. Continue with ‘Next’. Select “Reprog” button to download the latest calibration data onto the TechII diagnostic tool. The window ‘Transfer Data’ is displayed. A bar shows the progress of the download. After the closing of the SPS application the TIS 2000 start screen is again displayed. Finally, switch off the Tech 2 and disconnect it from the pc. Switch on Tech 2 – start screen appears. Turn ignition (Do not start motor!). Press “Enter” in the Tech 2 start screen. Select “F1: Service Programming System” in the main menu and then “F1: Program ECU”. Follow the instructions on the Tech 2 screen. During the download the Tech 2 screen shows the message “Programming in Progress”. At the end of the download the Tech 2 shows the message “Programming was successful”. The button “Exit” leaves the program. First, turn off the ignition of the vehicle, then switch off the Tech 2 and disconnect it from the vehicle. Turn off ignition for 30 seconds before starting the motor. Additional information is available in the section “Check programming”. This article includes all GM Tech2 Vetronix feedbacks Yes and No list, aiming to help the GM technicians who are new to GM TECH2. Before continuing reading, please note GM TechII works not on truck; go for VXDIAG VCX HD for truck. I have no other GM Tech from the same shop, but as I know some guys test ok too. How to use GM tech 2? Remind: press Ctrl+ F to search is easier. – Used my GM tech II to retrofit tcs and marry a non divorced cd changer. – reads everything a genuine one does. Heck, it’s probably made in the same factory as a genuine one with a different sticker on it. Pinpoint bad air bag sensors, turned on the tpms on both our Z’s. – Change one of my c5s that is canadien to US to disable the auto headlights because they don’t always open when they should and when they do work right they come on too early. – Is now fully functional for F body, C5 and C6, It cost me a lot more than the initial $1000 that I thought was a good deal. – If you had a Tech2, you could possibly talk to the dealer and have them access their TIS system to load the BCM or PCM calibration to your Tech2. Some may do it. If you can’t do that, just buy additional TIS2000 with USB key. -Tried it on my 2006 Silverado & worked ok.
-If you have a 1997-2000, the TPMS is in the firmware and cannot be programmed. With the addition of the Z06 in 2001-2004, it can be programmed. -Plugged it in to my 2011 Z06, and activated the Afterblow feature. I also cleared some old DTC codes that were in history. It works just fine and the quality feels genuine. It’s a pretty good knock off. Even came with all of the stickers from the Veltronix manufacturer. I assume they are knock off too. – Cars only, no trucks, be advised to use Allscanner VXDIAG VCX HD heavy duty scanner. How to fix GM Corvette C6 BCM or ECM problems?